Crowdfunding to get us a boat! Update: we did it, you guys! Thanks so much to all of our sponsors. I am not in this photograph, but don't let that stop you from imagining me in lycra. In 1921, humankind came to the momentous understanding that rowing would not permanently damage the fragile reproductive system of the human female, and thus the Somerville College Women's Boat Club began. In 1927 a Somerville rower participated in the first ever Women's Boat Race against Cambridge, and we've turned out several blues rowers and coxes since then. Fast-forward nearly a century, and the women's rowing team at Somerville College has been badly in need of a new boat for quite a while. 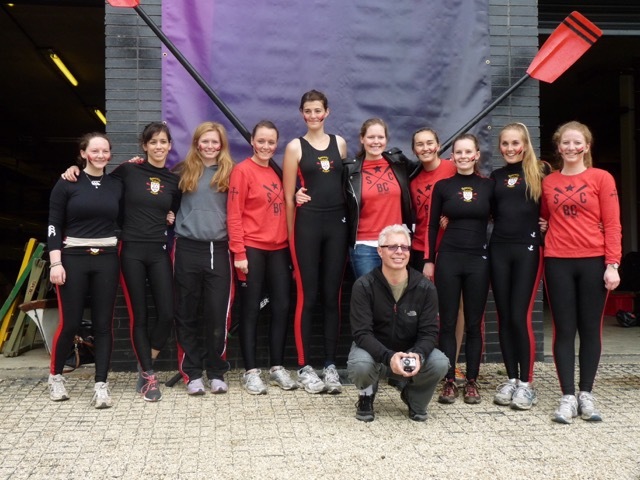 This year our first team are in the first division, and we need a boat as good as our rowers to go the whole way! We're trying to raise money for our new boat through gifts from our friends and family (unlike some colleges *cough* Green Templeton *cough* we don't have a lot of funding). Even five or ten pounds would go a long way towards helping us to reach our goal. Go to our crowdfunding page to find out more and to give your contribution. If you can't spare money towards our boat, we'd be really grateful if you could spread the word to anyone who might be interested (particularly old rowing buddies and people who have opinions about the Boat Race).